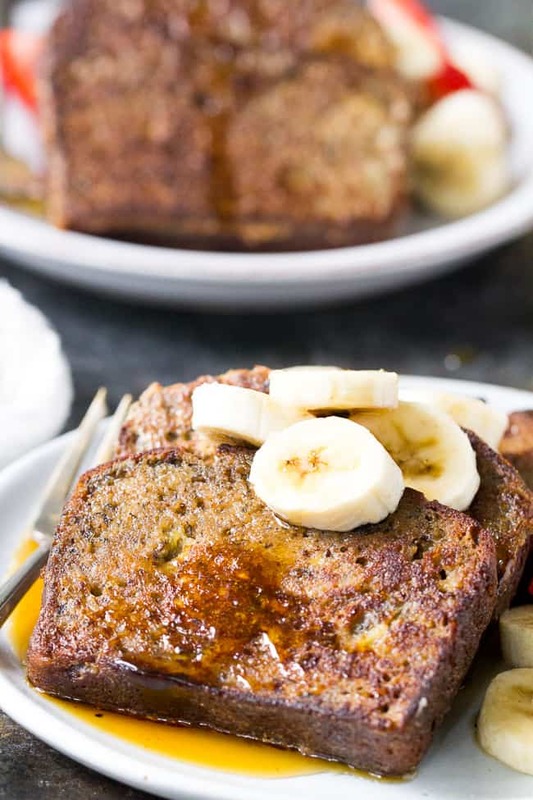 This Banana Bread French Toast is pure paleo breakfast comfort food! 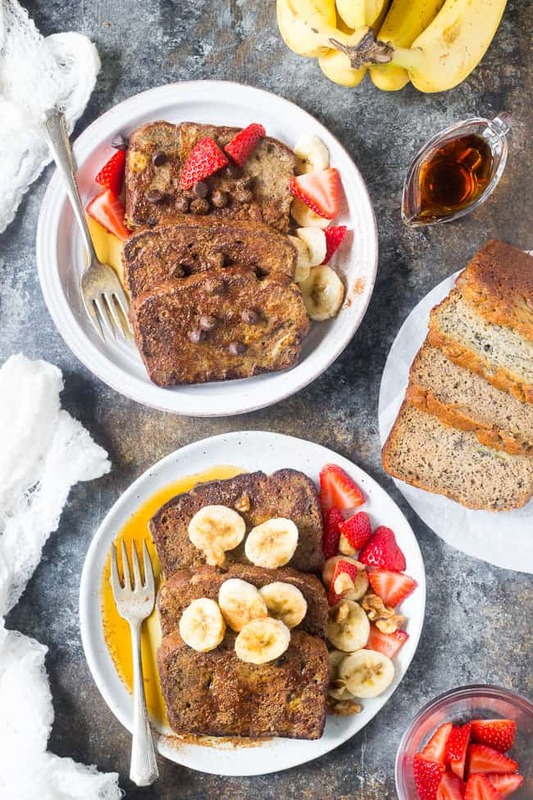 Made with a hearty banana-sweetened grain free and paleo banana bread, it’s perfect for a weekend breakfast treat when you’re craving something indulgent. Gluten free, dairy free, refined-sugar free. 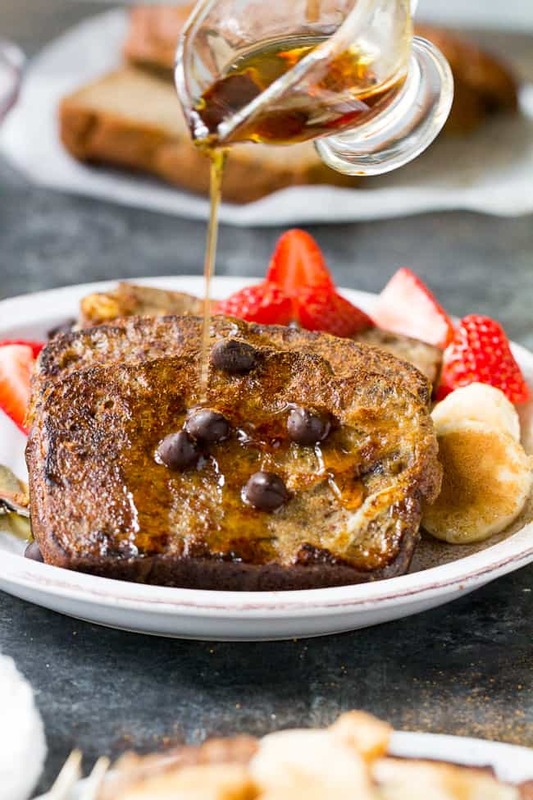 Yes, paleo french toast is quite possible, and, ridiculously easy and tasty if you ask me. You know all those loaves of banana bread you bake whenever you over-buy bananas? (Or when your family decides it’s a no-banana week. Is this just me?) 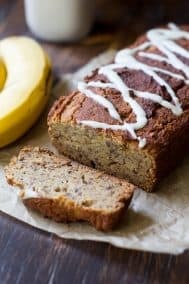 I almost always have a loaf of banana bread around, and most recently it’s been my banana-sweetened hearty banana bread that I posted just last week. 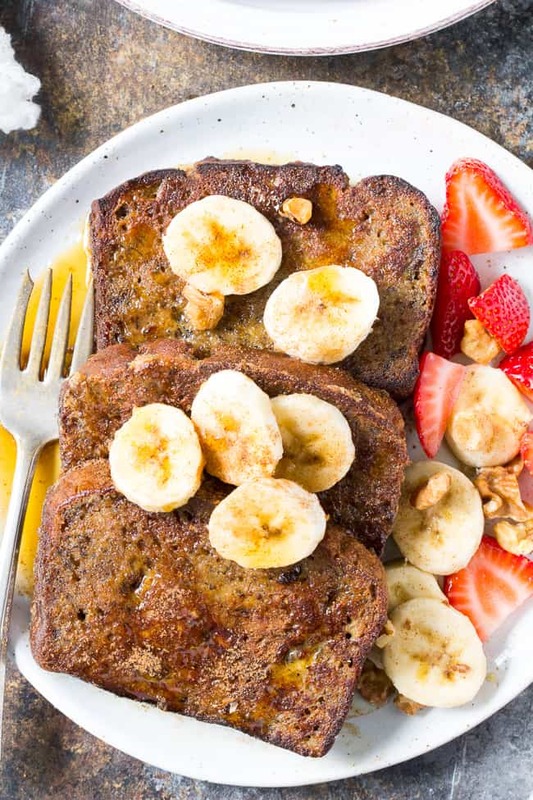 So, this banana bread french toast is a fun follow-up recipe that you NEED to try – because it’s the sweet indulgent breakfast comfort food that actually happens to be pretty good for you. Who knew?! We start with a loaf of paleo banana bread. I love using one with no added sugar, since you’ll be dressing it up all fancy, and, possibly adding your fair share of maple syrup. 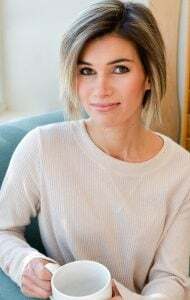 However, you can use whatever paleo banana bread you prefer, as long as it’s not too dense or overly moist, since that will likely lead to soggy french toast. 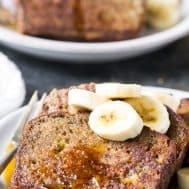 It definitely helps to use bread that’s more than a day old, and in a pinch, you can always “dry out” the slices in a warm oven for a few minutes to make them french-toast-ready. 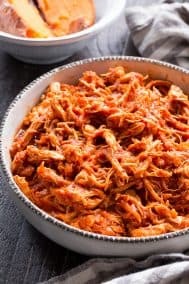 I used 6 slices of bread for this recipe, which is about 6 servings especially if you plan to go topping-wild when you’re serving. I say why not – the more toppings, the better! Berries and sliced bananas are great, but you can also go with dark chocolate chips or even fudge sauce, dust on a mix of cinnamon and coconut sugar, drizzle on more maple syrup, and sprinkle on some chopped nuts, coconut flakes, even a dollop of coconut whipped cream. Make it desserty or make it “classic” – it’s all good and lots of fun. Seriously, topping-wild is the way to go! This is a fun one for kids to help with – as mine did for the photoshoot. They could barely keep their hands off long enough for me to finish up the last of the “glamour shots” and once I was done, both (huge) plates were gone within 10 minutes between the 4 of us. Too bad Adam was at work and completely missed this one – and he’s now looking at the photos as I upload them wondering how the heck he was left out of this. 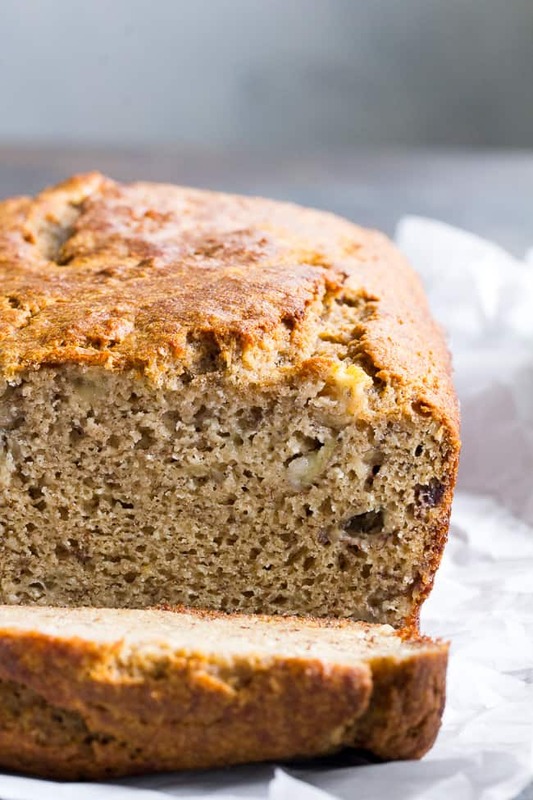 Luckily, this recipe is easy enough to make so it can go on repeat in your house – even if you have to actually make a whole banana bread just to get to the fun part. It’s worth it, trust me! Are you ready for breakfast? Or brunch or lunch or “brinner”? 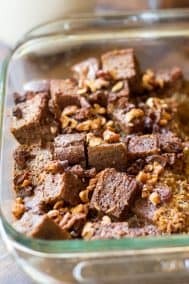 Get your banana bread going and then let’s celebrate our awesome selves and families with a deeeelish paleo breakfast indulgence! 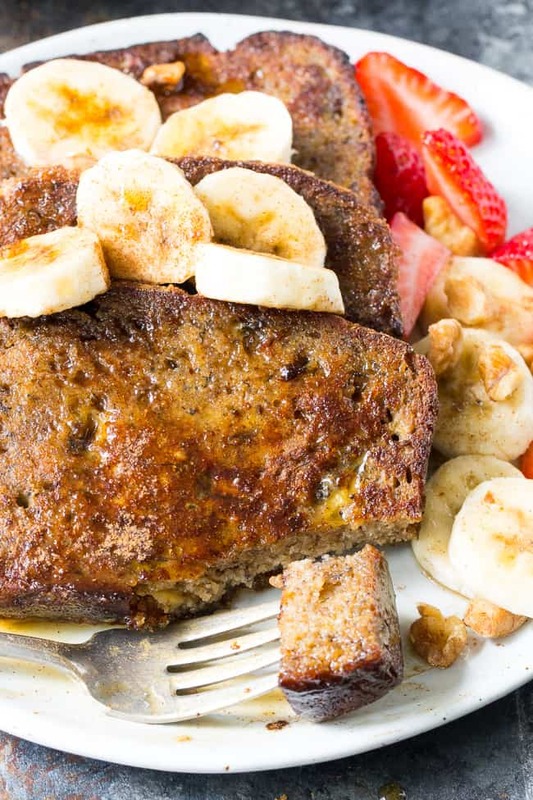 This Banana Bread French Toast is pure paleo breakfast comfort food! 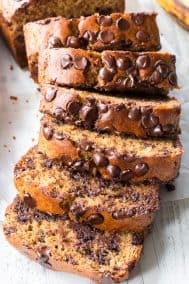 Made with a hearty banana-sweetened grain free and paleo banana bread, it's perfect for a weekend breakfast treat when you're craving something indulgent. Gluten free, dairy free, refined-sugar free. 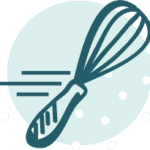 After slicing your banana bread, whisk together the eggs, almond or coconut milk, maple syrup, vanilla, cinnamon and sea salt. 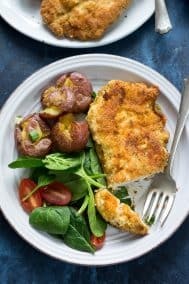 Heat a griddle or large non-stick skillet over medium heat and add 1 Tbsp coconut oil to melt. Fry on one side until golden brown, flip and cook the second side the same, then remove from skillet. Repeat the process with the second batch, adding a second Tbsp of coconut oil and adjusting the heat as necessary to avoid burning. 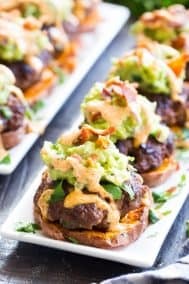 Serve warm with optional additional toppings. Enjoy! 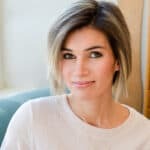 Want More Paleo Breakfast Treats? Try one of these! This was a huge hit with me and my kids. I froze half for an easy breakfast for my kids. 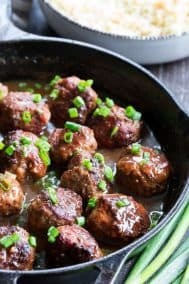 Thanks for an amazing recipe! Thank you, Michele! 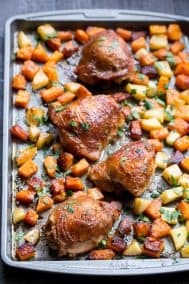 I absolutely adore your recipes, and this one was no exception.